We took a small day trip to the Wairarapa (==glistening waters) today. At least it was going to be a small trip. We left about 9:00 o'clock, after Christine had stuffed me with a cooked breakfast (Kiwi talk for bacon and eggs -- with perhaps some tomato or mushrooms thrown in). It was delicious -- better than I have ever ordered in NZ -- but then Christine is an excellent cook. 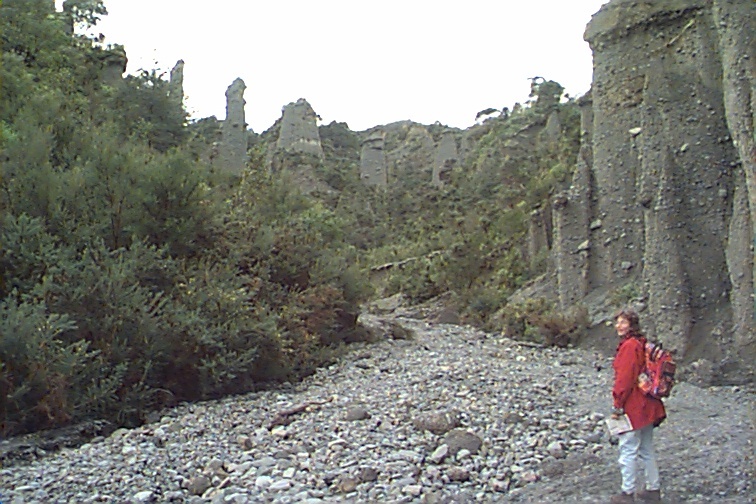 Our destination was the lower Wairarapa valley, in particular Cape Palliser. The Wairarapa is a rather flat valley close which one enters about midway, 60 kilometers from Wellington at Featherston. The route from Wellington is highway 2, up the Hutt valley, past Lower and Upper Hutt to the rimutaku incline. This is an interesting road. In the past we have normally done it in sunshine; today it was foggy with no views from the top so we did not stop. At Featherstone, which we have visited before, we did not stop, but rather veered right in an easternly direction to the lower Wiararapa center and wine region of Martinborough. This took us along route 53 for about 30 kilometers. We stopped in Martinborough for coffee. This is always an interesting process in New Zealand. It is not that coffe is not drunk here. It is just that each order is prepared separately -- a process that takes up to 10 minutes and which produces something barely drinkable. It cost $2.40. After coffee we went to the information center where Christine got the scoop on our days adventures. The New Zealand Department of Conservation has many walks all over the country. These are detailed in brochures (2-4 pages) which are available at the tourist information centers which exist in almost every town. It turned out that we would need to purchase a flashlight, which we were able to do at a gas station (no mean feat as there is little open on a Sunday). The flashlight (which was a small one) with batteries cost $10.00. And now we were ready for our trip to the caves. 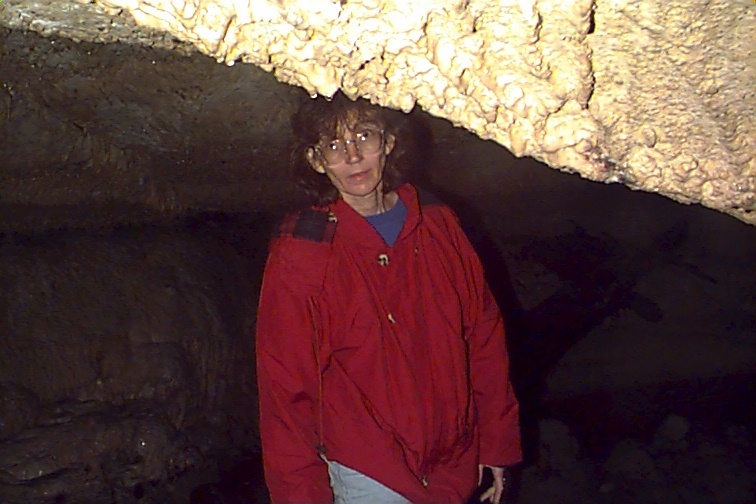 Christine has a thing about caves. If there is a cave, mentioned ever so parenthetically in a guide book, it is a must for our trip. The same goes for locomotives and other obscure technical wonders. I think she gets it from her childhood visits to similar sites with her father (and I imagine the rest of the family just loved to go along). About 15 kilometers from Martinborough are the "glow worm caves". The road is unnumbered; take the road south towards Lake Ferry about 3 kilometers and then turn east and follow the signs. Eventually you will get to a farm gate which will tell you to backtrack a half mile to get permissions to enter. When you get to the farm the permission, if granted, is written on a blackboard. Back to the entrance gate. Christine jumped out and opened it so we could pass. Then onto the next gate. In the vicinity of this gate were a number of Angus steers, looking ready for market. On the other side were this year's herd of young steers. We passed through and drove another half kilometer before reaching the entrance area for the caves, which are in a stream valley just below the road. 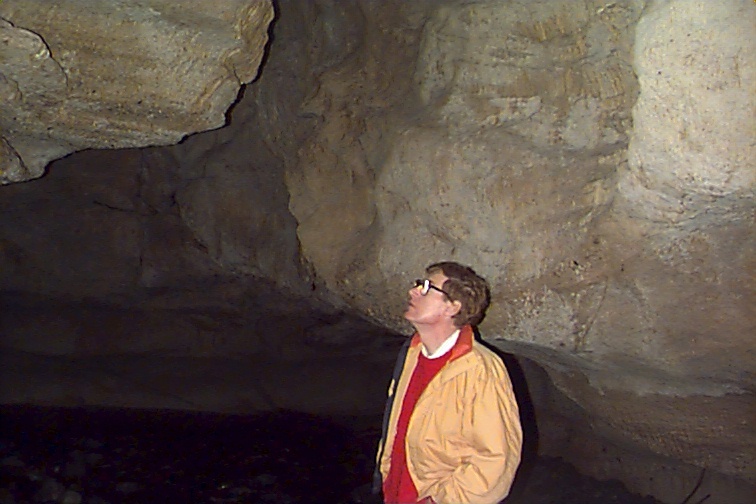 The caves (really one cave) have been carved by a stream that disappears into the earth. One follows the stream (walking through it -- Wellingtons are handy -- or you hop from rock to rock. in the dark, with an occasional wet foot). About 50 meters in you can see the glow worms. The roof of the cave varies in height from about 1.5 meters to about 6 meters. In the larger, higher chamber the glow worms appear against the wall as if they were a constellation of stars. Unfortunately I did not have the equipment to take photographs of the glow worms, but I did the get two photographs of Christine by shooting 'blind' into the darkness. 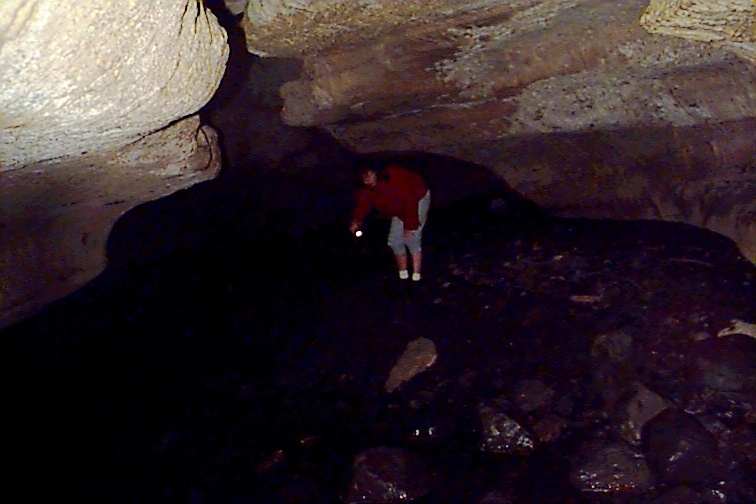 She then photographed me in the cave and as we left, with the entrance in the background. The thing that was interesting about the glow worms is that the glow was a constant monochromatic bluish white. Other phosphorescent phenomena that I have seen have always been of a flickering kind (such as the fireflys we have in America). It made one wonder what the nature of the reactions were that created the glow and also what the glow worms lived on. Clearly the basis for another research project and return visit. From here -- the morning was passing and it was close to noon -- we made our way to Lake Ferry. This place is so named because at one time a ferry served to move coastal foot passengers across the river mouth on Cook Straight, at this place. This is an impoverished little community of about 20 small houses and the site of Lake Ferry Hotel. I had once thought that we might spend the night here, but was fortunately advised against it. There is a large bank of pebbles now across most, if not all, of the opening and behind this is a small salt water inlet or lake. A few people were fishing, but with no apparent success. There was a lot of driftwood on the shore. 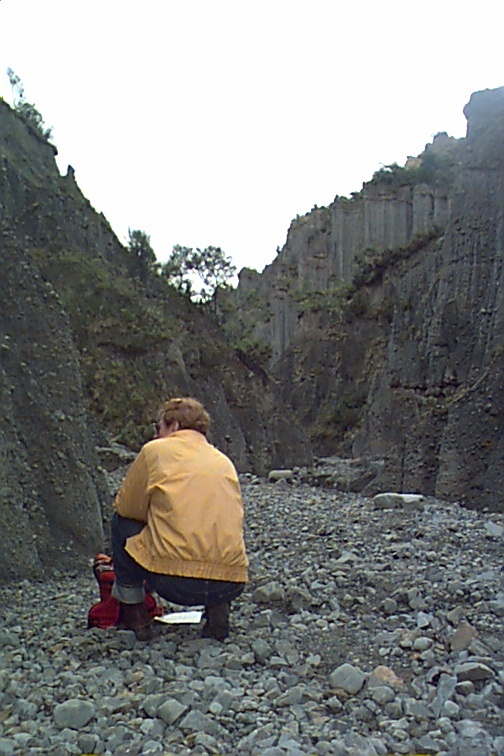 We stopped and had a picnic lunch here, before pressing on to the pinnacles. From Lake Ferry we backtracked about a kiometer and then took the coast road east towards Cape Palliser. Our destination: the Putangirua Pinnacles. This is an area of scree that has been compacted and lifted out of the sea, rising to a height of about 200 meters. 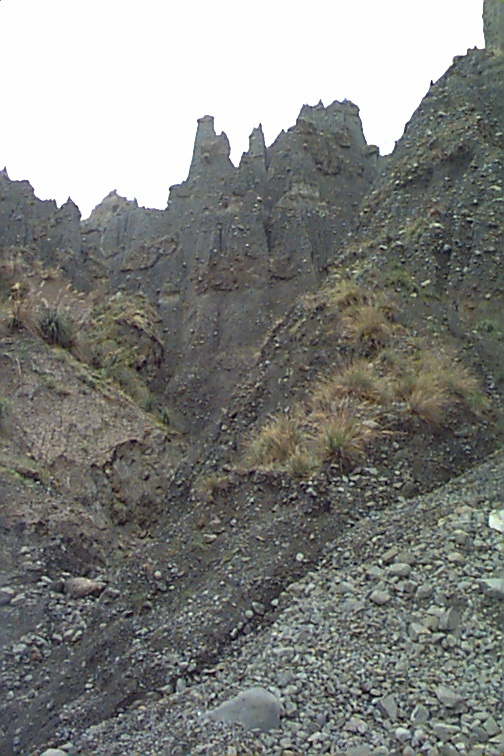 The erosion of the land over the millenia has left pinnacles of harder material which provide some interesting views. And of course, the whole area provides yet another excuse for climbing and walking. We followed the stream bed upstream for about 45 minutes until we reached the source area for the flow. 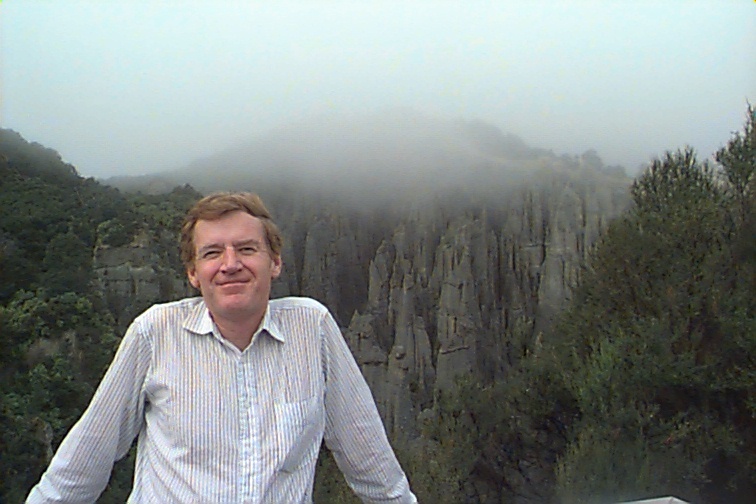 The palisades appear in the background of this picture taken about 10 minutes before we reached the source. At the source the scree is a collection of various sized rocks that have fallen to the stream bed from the surrounding pinnacles, as seen in this photograph which is taken looking towards the pinnacles. Looking back from whence we came we glimpse some of the magnitude of the area and the steep slope in this upper part of the stream bed. From here we backtracked to the lower part of the stream and then ascended (why not?) the side of the valley to gain a good view of the pinnacles. Then we walked back to the car through a bush track. As we came into the stream valley we had a good view of a flock of 'silver eyes'. These are a warbler sized bird with an olive upper coloring, rufous coloured sides, and a white underbelly. They appeared to be feeding on insects in the gorse. Next we followed the coast a little further towards Lake Palliser. Our destination was the Cape Palliser lighthouse. We saw it, but did not reach it. Our failing was the second ford. We did go over a single lane bridge for cars only (there are many single lane bridges in New Zealand, but this was the first that we had seen that was labelled for cars only). And we did go through one ford. But the second ford was too rough in my judgement, so we stopped there, the lighthouse visible about a kilometer away (fortuneately it did not occur to our tour guide to suggest that we walk there). At the first ford, there was a strange stench in the air. A few hundred meters further along and we found its source. 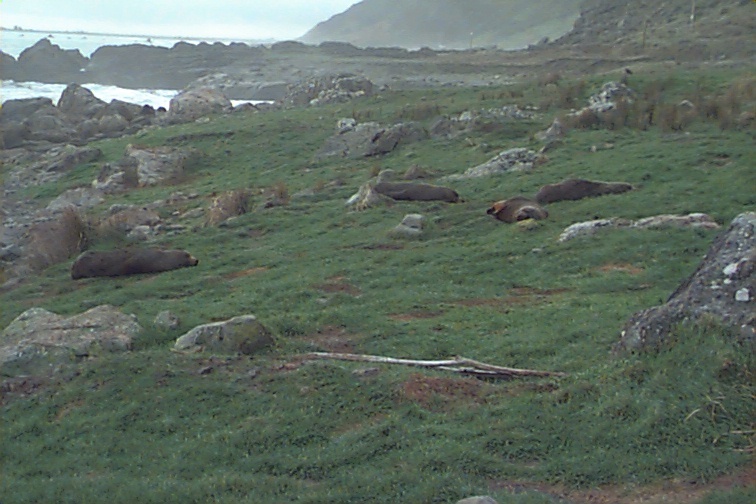 The coast area was covered in seals. I counted, easily, 50 lying about on the ground and rocks of this area. 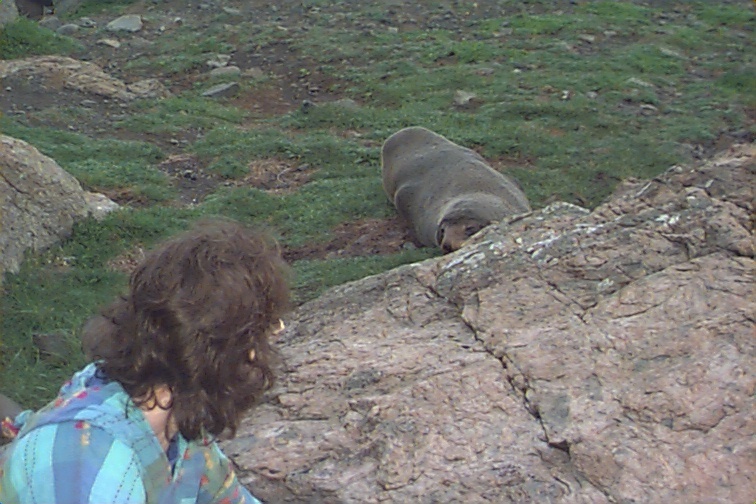 They were quite insensitive to our presence and we were able to approach quite closely. From here we returned (it was now about 4:45 in the afternoon) to Wellington, ariving about 6:30.